I love this time of year: the leaves; the winter coats, hats and gloves; the making of the Christmas cake. 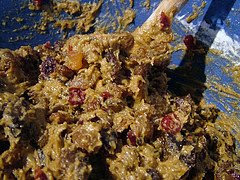 I'll be posting a recipe for an organic vegan Christmas cake very soon. I adapted it from a Rose Elliott fruit cake. I've made it the last two years and it is fruity, rich, and brandy-soaked for extra flavour and a soft texture.